Today’s fathers want to provide their families with more than just a paycheck, according to a recent survey. Modern dads believe that caring for their families’ emotional and physical needs is just as important as caring for their financial needs, according to The New Dad: Caring Committed and Conflicted study by Boston College Center for Work and Family. The 2011 study, part of an ongoing look at the role of fathers, cited that two-thirds of study participants believe both things have equal weight, with less than 5 percent seeing themselves as being a financial provider alone. 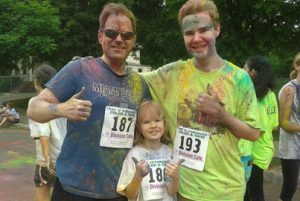 Rick Verbanas, marketing and new business development director, enjoys time with his kids during a family activity. In honor of Father’s Day, the gentlemen of CMA explain how they manage work-life balance. Flexibility is key to managing personal lives and work lives. Verbanas is not alone in his desire to balance work and fatherhood. A continuation of the study called The New Dad: A Portrait of Today’s Father done this year cites flexible working arrangements are highly valued by today’s workers. In fact, according to most surveys flexibility is one of the most prized benefits offered to employees. In the college’s 2011 study, working fathers ranked flexible work arrangements even higher in importance than career advancement opportunities or high income. Boston College’s research also shows that more than three-quarters of fathers reported using flex-time, 57 percent worked from home at least some part of their time and 27 percent utilized com- pressed work week. However, the value of workplace flex schedules aren’t specific to fathers. Employers who have flexible work arrangements have employees who feel significantly more satisfied with their job. Flexibility is also good for the employer with employees reporting that these arrangements improve their productivity (85 percent), morale (84 percent), loyalty (82 percent), relationships with co-workers (77 percent), team communications (81 percent), and overall job satisfaction (86 percent). For Elgart and Verbanas, giving their all at the office allows them to mentally relax in the off hours. Learning to turn “off” the work is a skill that men have to learn. Technology, with all its connectivity, makes finding balance even harder, especially when we are used to looking at smart devices when they ring for a new message. Even CMA’s President and CEO Jeffrey Barnhart flips the off switch during personal time, often fishing miles offshore where the cell phone doesn’t work. As CEO, Barnhart admits he feels the pressure to be “on the job” 24 hours a day, seven days a week, but he has learned downtime is essential for success of the business.